Over the past couple of years NCO and The Gardens Project has become a clearing house for food issues - and as a result of that we have come to meet some really great farmers, gardeners, food movers, food enthusiasts, and in general, some really inspirational people. Right here in Mendocino County. The local food movement in Mendocino County is strong and you all are doing some crazily innovative things here, and we really think that it needs to be documented- which is why we're so excited about being made a community partner with StoryCorps, a non-profit that documents peoples stories. StoryCorps' mobile unit is in Ukiah until May 21st, and will be collecting peoples stories in their funky airstream trailer parked at Clay and School street (right across the street from the Farmers' Market - need I say more??) We have two slots left and we're looking to fill them up with people who are working to create a local food economy - which (in our opinion) includes pretty broad spectrum of people. If you are someone (or know someone!) who gardens in a community garden, a farmer, a pre-school teacher who incorporates food from the garden into the classroom, someone who advocates for healthy foods, someone who is donating land for a farm or garden, or someone who has a story to tell about food then contact us! 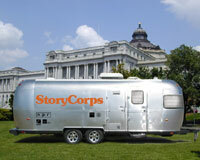 If you're interested in learning more about StoryCorps or want to book an appointment with them, contact them here. Thursday, April 14, 2011 Filed in: Events | Thank You! 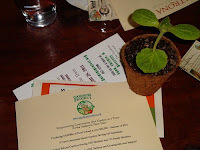 Our second annual dinner, Sharing The Bounty, was a fabulous event! Even though we moved offices and had no phones during the week leading up to the event, we surprised ourselves by selling out for the second year in a row - Patrona was filled to a max with 70 people in attendance. The evening started with some lovely bluegrass music provided by the Stormy Weathermen, and appetizers of beet sliders and uni risotto balls. After a creamy ambrosial stinging nettle soup was served. The main course followed consisting of a choice of red snapper with carrot ragout, or a delicious baked kale and seaweed pie. Is your mouth watering yet?? One of most unique aspects of this event is that all the food is made of local food, directly from our county. To make this dinner possible was a true community effort - without the farmers who donated their hard labor, without the staff at Patrona who donated their time, without the guidance of Craig and Bridget, and without community members who support community gardens none of this would be possible. So, thank you. Your efforts resulted in raising $10,000 for the development of school and community gardens! Farms who donated: Lovers Lane Farm, Petit Teton, Shamrock Artisan Goat Cheese, Green Uprising at Blackberry Farm, Stella Cadente, Campovida, Ukiah High School, Willits High, Mendocino Grain Project, Brookside Farm, Mendocino Lavender and Herbs, Little Lake Grange Grains, and the WISC community garden. Wineries who donated: Trinafour, Jeriko Estate, Arnaud Weyrich, Nelson Family Vineyards, Barra of Mendocino, Husch Vineyards, Solomon Tournour Distillery. Don't pay for a bunch of soil, grow soil! Don't pay for a bunch of water, save water! Urban agriculture has no excuse not to grow food because of the latest techniques used to create garden beds. 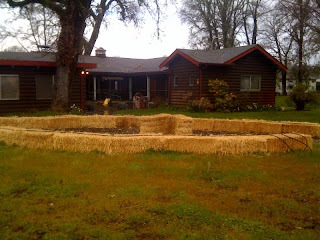 At the Willits Integrated Service Center straw bales are the way to reclaim the land, provide an amazing example of urban gardening and produce food for community. The theory is very simple. If there is space that has no soil, in our case the middle of our court yard, it is better to grow soil rather than paying a lot of money to bring soil in. The straw bales become raised garden beds that can be used to grow anything but a root vegetable. The bales will break down into a berm of soil as beautiful as a compost pile in two to three years. The Nutrients the plants need will come from a 1" layer of potting soil and other specific inputs put on top of the bale. The bale itself acts as a rooting medium that will hold moisture and uptake applied nutrients. The result is an instant raised two foot raised garden bed for less than $10! First, purchase or get donated straw bales that are as seed free as possible. Our 25 bales of straw were donated from J.D. Redhouse, the local feed store. 2. The bales have been induced with a high nitrogen organic fertilizer, in this case, chicken and sea bird manure and water from a soaker hose. Within one week the bales had reached a temperature of 70 degrees. The bales will heat up for about 1 month and get very heavy with water and reach temperatures of 140 degrees. 3. The bales will be given the specific type of input they need for the plants they are growing before they are planted in. 4. The 1" layer of potting soil on the top is not necessary but is suggested if direct seeding. 5. Plant the plants on top of the bales by digging a small hole in the soft top side of the bale. 6. Water the bales once a day at first and then as the plants are more established, watering can be cut back to once every two days or sometimes once three days depending on the weather. We will use a drip system, donated from Drip Works, that will apply the water exactly where it needs to go. 7. Harvest the food when it is ready. We will repeat steps 5, 6, and 7, until the bales have turned to berms that create food for the people. Last Saturday was a celebration of Ukiah's efforts to become a more self reliant community. We hope that everyone who came out had a blast, enjoyed lots of good food, met some new people, and got a different preservative on whats being grown in our community spaces of Mendocino County. In case you missed it some highlights include: Jack Simpson gardener Oliver Schearer dazzling us with his vibraphone skills. Cleveland Lane gardeners showing us what a mini Ukiahn-Michoacan would look like. Washington Ave. gardeners celebrating their successful first season with Ensalda de Nopalitos. April Cunnighman from Head Start showing off school garden curriculum. Grace Lutheran gardeners sharing their favorite recipes. 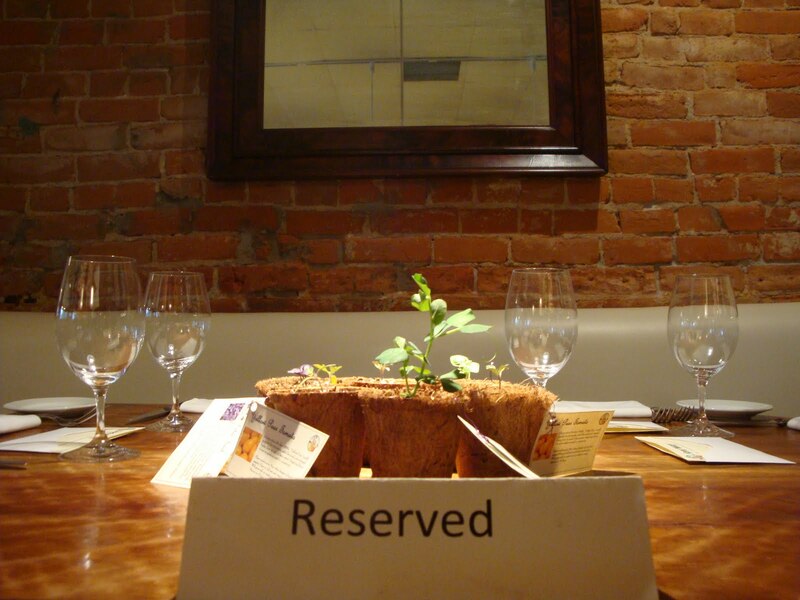 Thank you again to all of our supporters: Tierra-Art,Garden, and wine for the use of their space. 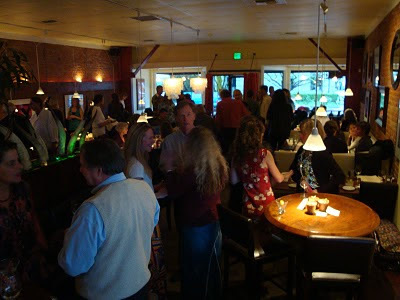 Ukiah Brewing Company, Patrona Resteraunt and Lounge, and The Ukiah Valley Medical Center for chef time of Molly Vogel, Phil and Craig, and Jim Stuart. Together we Can! for providing us with volunteers. Mara Montiel, Sid Cooperrider, and Will Siegel and friends for providing music, and of course all of our wine donors - Rivino Wines, Frey Vineyards, and Raye's Hill vineyard. Thank you all for your support - we hope to see you again next year. Monday, April 12, 2010 Filed in: Events | Thank You! 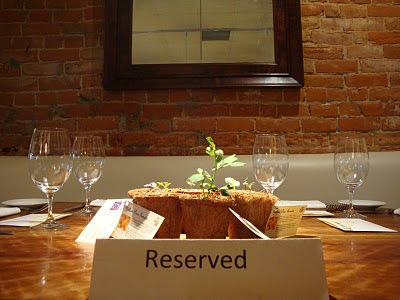 Thank you to everyone who participated in our first ever fundraiser dinner, "Sharing The Bounty" last night. Together you helped The Gardens Project raise just a little over $9,500 dollars! The evening started out with violin music by Mary Carnevale and Holly Fagen as well as appetizers which included green garlic crostini and tulip petals with chive cheese. Who knew you could eat tulip petals?! Then came a mixed green salad with Miner's lettuce wrap (we will never look at Miner's lettuce as a weed again..) where Mendocino Organics generously donated fresh baby chard and kale, and Green Uprising Farm at Blackberry Bend Farm donated baby salad greens. The main entree was lamb from Magruder Ranch in Potter Valley, or amaranth wrapped with chard from Nokomis and South Ukiah head start. The evening ended with a Meyer lemon curd made from Lemons from Dave's back yard, as well as Douglas Fir ice cream. To say the least - we had a blast, and we hope you did too. 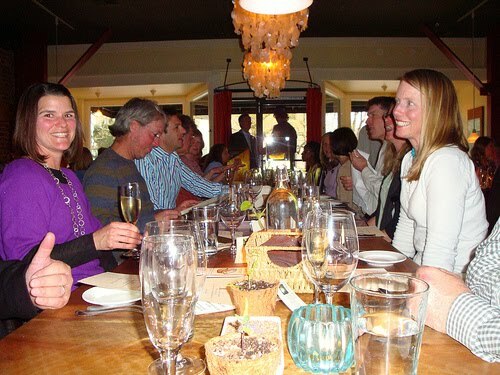 The wine was great, the food was beautiful and tasty, and the company was the best! Thank you to the staff at Patrona as well as Craig and Bridgette. Many of the staff donated their time to help with this event and Craig and Bridgette donated the space, their energy, and their time to make this event happen. A huge thank you to Trinafour Cellars, Magnanimous Wine Group, Husch Vineyards, and Paul Dolan who supported us by donating wine. Thank you to Mendocino Organics, Green Uprising and Blackberry Bend Farm, Magruder Grass Feed Meats, Dave from Dave's bike shop, and Huckleberry Hollow Gardens who donated or contributed food for the meal. And finally, we want to note that the a lot of the food for this event was grown locally in our community gardens! All the chard was from South Ukiah and Nokomis Head Starts, as well as the parsley and chives. About half of the green garlic came from Jack Simpson, the thinning vegetables came from Grace Lutheran, and the Kale came from Talmage. And thank you again to everyone who is working to make Mendocino County a more healthy and self-reliant community. Ten Mighty Mujeres turned up to lend a hand at Saturday's ¡Spring Garden Blitz! at the Head Start Family Garden. Head Start moms and their little ones, ladies of the Food Forest and a crew of girls and a mom from Fort Bragg 4H spent the afternoon making a new bed, building shelves in the toolshed, weeding, planting, turning compost, mulching and more! Our desired outcomes for the summit were to 1) build the network community by getting to know each other and the gardens, 2) build confidence as a garden organizer and ownership of the coordinator position, and 3) assess needs of individuals and the network and to connect with resources. The Gardens Project offered skill building sessions on organizing a work-party and connecting to resources, but the most exciting part of the day was the sharing that took place between the garden coordinators throughout the morning and over lunch. 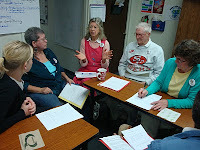 These coordinators are not often able to interact with each other, so the reassurance that there are others in the County with whom to learn, share, brainstorm, and grow was invaluable. Creating a space for community members to empower each other is vital to The Gardens Project mission, and this summit proved how hungry we all are to work together, with revolutionary zeal, towards a healthier food system in Mendocino County. There will be more events like this in the future, as the feedback we received was overwhelmingly positive. The Noyo Food Forest entertained about 300 guests at the Black Tie Boogie, held at the Redwood Coast Senior Center on February 13th. The Senior Center was transformed into a red, black and silver classy dining room and adjacent jazz lounge, complete with a kids activity room and silent auction. The event had something for everyone and truly brought together people from different generations and pockets of the community. The Senior Center served 180 meals that featured locally grown and organic food. Everyone was dressed to the nines and enjoyed a beautiful meal by the Senior Center’s Chef and yummy desserts provided by the Montessori del Mar Learning Center. In the other room the Richard Cooper Trio and Lavender Grace entertained the crowd that mingled at the bar and relaxed at the cocktail tables while sipping local wine and beer. The silent auction was a hit with exciting items generously donated by local businesses and community members. The kids had a great time with activities provided by Sue Magoo and Jenny, Too of the Mendocino Coast Children’s Discovery Mooseum. Later in the evening the jazz ended and DJ Selector Science played as people young and old boogied down on the dance floor. There was even a special performance by three superstar hula hoopers! The Food Forest would like to thank everyone who helped make his event possible! We are so grateful for all of our WONDERFUL VOLUNTEERS and all the SUPPORT from our GENEROUS COMMUNITY! Save the date for the Noyo Food Forest’s next fabulous and fun FREE fundraising festival…. at the Learning Garden at Fort Bragg High School. Live music, food, pedal-powered smoothies, workshops, interactive community art, kids activities and performances, and more!!! For more info or to get involved please contact the NFF office at 964-0218.